袁庆虹, 陈敏, 杨向东. 云南省2006-2017年恙虫病流行病学分析[J]. 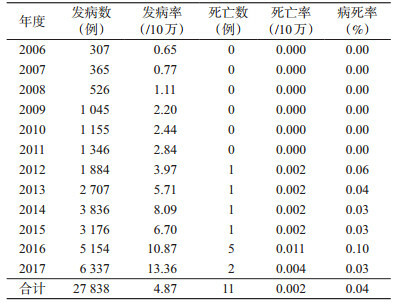 中国媒介生物学及控制杂志, 2018, 29(6): 613-616. YUAN Qing-hong, CHEN Min, YANG Xiang-dong. Epidemiological analysis of scrub typhus in Yunnan province during 2006-2017[J]. Chin J Vector Biol & Control, 2018, 29(6): 613-616. Abstract: Objective To analyze the epidemiological characteristics of scrub typhus in Yunnan province from 2006 to 2017, and provide the scientific evidence for the prevention and control, so that to reduce the incidence of scrub typhus. Methods To collect data of scrub typhus in Yunnan province from 2006 to 2017, and use descriptive epidemiology and SPSS 17.0 software for analysis of the temporal and spatial incidence and mortality of scrub typhus. Results Scrub typhus cases occurred every year in Yunnan during 2006-2017. A total of 27 838 cases were reported cumulatively, of whom 11 died. The annual incidence ranged from 0.65/100 000 to 13.36/100 000. The overall case fatality was 0.04%; the scrub typhus cases occurred in all 16 prefectures, the cases were reported from 118 of 129 counties (cities). Baoshan and Lincang cities had the most cases (41.94%), while Diqing prefecture had the lowest incidence. The cases mainly occurred in August, with a high temperature and rains. Most patients were children aged 0-5 years (13.16%) and farmers (68.41%). The ratio of male (49.53%) to female (50.47%) was 0.98:1. Conclusion The incidence of scrub typhus in Yunnan province is high, mostly in August, which belongs to summer and autumn type. Scrub typhus is prevalent in farmers and the children aged 0-5 years. There is no significant difference between males and females. Strengthening the health education in epidemic areas, improving the diagnostic ability, enhancing the protection in the field and carrying out the patriotic health campaign with rodent and chigger control are the important measures to prevent the scrub typhus. 党荣理, 任立松, 李海龙, 等. 新疆北部地区恙虫病疫源地宿主动物和传播媒介调查[J]. 医学动物防制, 2012, 28(11): 1188-1190. 吴家兵. 我国恙虫病疫源地研究进展[J]. 安徽预防医学杂志, 2010, 16(6): 467-469. 陈渊民, 冯锡光, 雷亚民. 云南恙虫病立克次体血清分型[J]. 中国人兽共患病杂志, 1997, 13(1): 13-16. 孙明, 汪东亮, 赵春云, 等. 宿迁地区32例恙虫病临床特征分析[J]. 中国血吸虫病防治杂志, 2013, 25(6): 639-641. 高丽芬, 胡海梅, 胡秋凌, 等. 2006-2014年云南省楚雄州恙虫病流行特征分析[J]. 现代预防医学, 2016, 43(2): 207-210. 袁庆虹, 张海林. 金标免疫层析法检测恙虫病抗体的效果测评[J]. 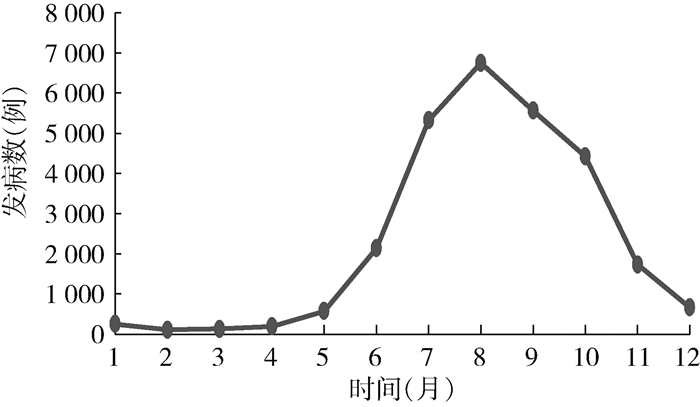 中国媒介生物学及控制杂志, 2010, 21(3): 257-258. 辛化雷, 张永杰, 胡建利, 等. 2006-2015年江苏省恙虫病流行病学特征分析[J]. 疾病监测, 2017, 32(3): 232-236. 孙良, 万俊峰, 田亚珍, 等. 安徽省阜阳市2011-2013年恙虫病流行特征分析[J]. 安徽预防医学杂志, 2014, 20(5): 356, 376.